What is the secret to playing really tight rhythm guitar like a pro? Hint: it's not playing to a metronome or learning lots of riffs. Tight rhythm guitar playing is about training your ear to focus on the right things when you practice. This allows you to identify sloppy rhythm guitar playing mistakes and fix them. Answer: Playing in time is only one aspect of rhythm guitar mastery. There are MANY other elements of tight rhythm playing that practicing with a metronome cannot help you master. 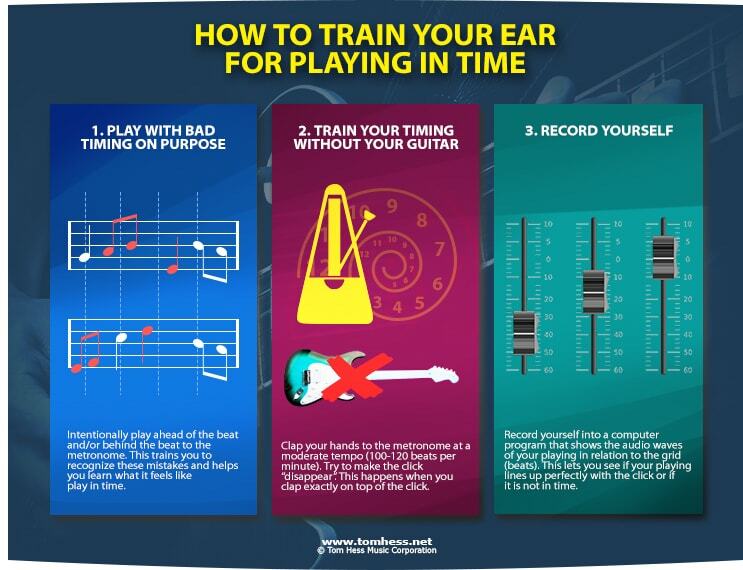 More importantly, “playing to a metronome” does not automatically improve your timing. Metronome practice only works when you know what to listen for and what mistakes to avoid (more on this below). How good are you at identifying rhythm guitar mistakes? Take this rhythm guitar playing test to find out. Palm muting everything makes it hard to emphasize important notes or chords in your rhythm guitar riffs. The purpose of muting some notes and not others is to create a contrast between muted and unmuted notes (and chords). The contrast makes the unmuted notes emphasized. The other reason to mute notes is for the percussive sound and tighter control over the strings when playing. Answer: Yes, if you want your rhythm playing to sound as good as possible. You MUST plan out your palm muting in guitar riffs you intend to record. This is key to recording tight guitar parts like a pro. This also helps you record your music quickly and saves you A LOT of money in studio costs. That said, planning out which notes to palm mute is not hard. You quickly learn to feel which notes and chords need muting and which ones don't. Type 1: Randomly changing which notes are muted. Listen to an example. You first hear a rhythm guitar riff played with consistent muting, followed by the same riff played with inconsistent muting. The first recording of the riff (0:00-0:09) follows the palm muting pattern shown in the tab. The second version of the riff (0:10 - 0:19) has inconsistencies in measures 2, 3 and 4. Sometimes the chords are muted where they shouldn’t be and other times the chords are NOT muted where they should be. The fill in measure 4 is played with (sloppy) palm muting instead of being played unmuted. Type 2: Randomly varying the intensity of your palm muting. Listen to an example. You first hear a power chord played with consistent muting, followed by the same power chord played with inconsistent palm muting. Sometimes the muting is just right, sometimes it is too weak and other times it is very aggressive. Both versions of inconsistent palm muting tend to occur together. Note: Randomly inconsistent palm muting is NOT the same as intentionally varying your palm muting. The former is a result of sloppy guitar playing. The latter is done on purpose to create rhythm guitar variations. Aggressive palm muting is caused by pressing too hard on the strings with the palm. It is also caused by placing the palm too far away from the bridge (closer to the fretboard). This makes palm muting sounds exaggerated. Your pick strokes sound like percussive thuds instead of actual notes (or strums). Exaggerated palm muting develops from taking palm muting for granted and never really listening to your own playing. Record yourself often and listen back with your full attention. Ask yourself: “What might I change about my palm muting to make this riff sound better?” Then implement your corrections in your next guitar practice session. Tip: Listen back to your playing using headphones. This helps you concentrate better and hear your playing more clearly. Mastering palm muting also makes it easy to articulate the notes clearly in your rhythm guitar riffs. Balancing the right amount of palm muting with playing some notes unmuted makes your riffs sounds tight, clean and pro. Inconsistent palm muting often falls on awkward places within the riff. Example: muting the downbeat and playing the rest of the riff unmuted. Inconsistent palm muting is often accompanied by sloppy string noise and weak articulation (and other mistakes described below). Inconsistent palm muting has no predictable pattern to it. This makes your playing sound random. 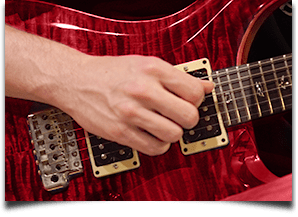 An expert guitar teacher can analyze your rhythm guitar playing and give you honest feedback on its tightness. guitar riffs in a rock/metal style. Start playing killer heavy metal rhythm guitar using these 5 tips. guitarist and fix your weaknesses. Hear the difference between playing ahead of the beat, behind the beat and on the beat. This tells you how close you are to playing in time. Have specific practice strategies to correct your timing problems. Your mind must be focused like a laser on training you to play in time. A metronome is only useful after your mind (and ears) know what to focus on and how to focus on it. Without this awareness, metronome practice becomes mindless. Mindless practicing is a complete waste of your time. Playing ahead of the beat. This means your notes are displaced and occur before the metronome or drum beat. Playing behind the beat. This means your notes are displaced and occur after the metronome or drum beat. Playing all over the place - this means your timing is inconsistent. Some of your playing is ahead of the beat and some of it is behind the beat. The goal is to play on the beat. This means your notes and chords fall exactly on top of the metronome or drum beat. Listen to an audio example of rhythm guitar played in time. Listen to an audio example of rhythm guitar played ahead of the beat. Listen to an audio example of rhythm guitar played behind the beat. Double tracking rhythm guitar parts is the ultimate test of playing in time. Both tracks must be in time with the beat and with each other. When you can consistently double track tight rhythm guitar parts, you have mastered this element of rhythm guitar playing. Taking rhythm guitar lessons helps you master perfect timing a lot faster. As your ears improve, test your rhythm guitar playing to track your progress. Good picking articulation makes it easy to hear each note (or chord) in your guitar riffs. Poor picking articulation makes it hard to hear what notes are played. Weak Pick Attack - this means picking the notes too lightly when you play rhythm guitar. Inconsistent Pick Attack - this means hitting some notes loudly and others softly. This imbalance makes it hard to articulate the notes clearly. Sloppy 2-Hand Synchronization - this means your hands are picking, fretting and releasing a note at different times. The faster you play, the more obvious 2-hand synchronization problems become. This makes it much harder to articulate the notes clearly. 2-hand synchronization problems are caused by sloppy guitar technique and poor practice habits. This eGuide shows how to improve your lead guitar technique and play guitar fast. Record your rhythm guitar playing regularly and analyze your recordings. This trains your ear to identify weaknesses that hold your playing back. Make a list of specific problems you want to fix. This helps you avoid overwhelm and tells you what to do next to improve your guitar playing. Focus on one problem in isolation until it is fixed. This tactic is best for short-term problems that can be solved quickly. Rotate your focus among several problems in the same practice session. Example: repeat a guitar riff for 30 seconds focusing on palm muting. Then play it for 30 seconds focusing on playing in time. Next, focus on your picking articulation for 30 seconds. Rotate through this mini circuit over and over for 10-15 minutes. This tactic works best for long-term development. Get feedback on your playing from an expert guitar teacher to track your progress and become a better rhythm guitarist a lot faster. The next step to mastering rhythm guitar is to discover your rhythm playing strengths & weaknesses, so you can fix them and become a rhythm guitar playing badass. Take this free rhythm guitar test and learn how to make your friends jealous of your awesome playing. About Tom Hess: Tom Hess is a guitar teacher, music career mentor and guitar teacher trainer. He teaches rock guitar lessons online to students from all over the world and conducts instructional live guitar training events attended by musicians from over 50 countries. Study the best rock and metal guitar lessons online.